This is inspired by the multi layered calzones I have seen in several Italian Bakeries in Bostons North End and at Quincy Market. You can make this in many different ways. Make your own pizzadough with spices and a lot of olive oil, and use your own homemade tomatosauce and you'll get an even more excellent result than I did. 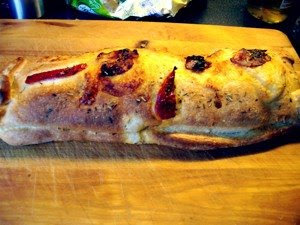 But believe me, use ready made pizzadough and canned tomatosauce, and it still tastes great. Roll out the pizzasheet. Place ingredients a few inches away from the edge, as this will be folded over. Brush some olive oil on, and add som dried herbs. 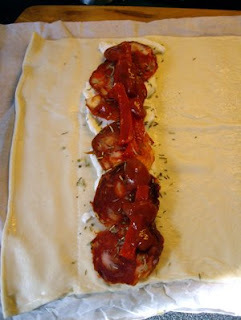 Then place thin slices of mozarella, salami, red pepper, and place some tomato sauce at the top. The fold the left edge over. Seal properly by pressing the dough with you finger. Place another layer of filling and add tomato sauce. 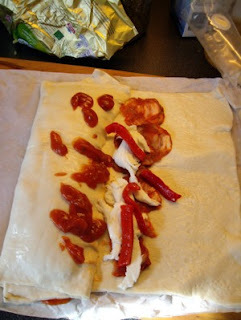 Fold the left edge over and do it once more, leaving a few inces of dough on the right side. 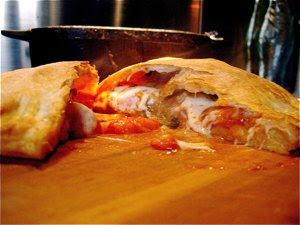 Fold the right edge of the remaing dough over and seal it thoroughly to keep all the goodness inside. Bake in a hot oven 180-200C / 400-440F, for 25-35 minutes. Alllow to rest a few minutes before serving. Serve with salad. 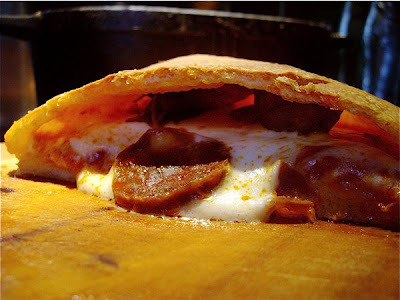 Crispy crust on the outside, wonderful italian taste sealed inside.